Late in 1777 Mozart received a commission from a wealthy Dutch music lover, Ferdinand de Jean, to write three concertos for flute and several other chamber works with important flute parts. The fee was to be 200 gulden and the flute parts were to be kept simple, presumably because de Jean, who was an amateur flautist, intended to play them himself. Mozart almost completed the commission in full, providing two complete concertos, an andante for flute and orchestra and two flute quartets. The first of the two concertos, K313, was completely original, and the second, K314, was a substantial reworking of an oboe concerto, which was probably written the previous year in Salzburg. The oboe concerto was believed lost at the time Kochel made his catalogue of Mozart’s works. The manuscript was re-discovered in 1920 and is now often also indexed as K314. In the end de Jean only paid Mozart 96 gulden. He may have been dissatisfied because he received a re-cycled concerto or possibly because the solo parts make no concessions whatever to the amateur musician. 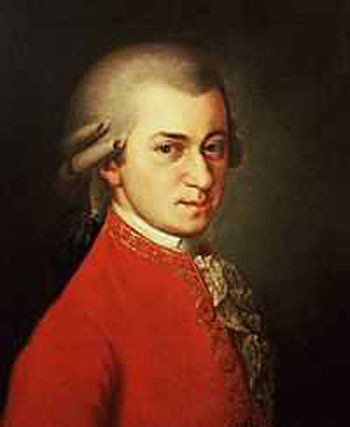 Mozart worked on the flute concertos and quartets early in 1778 in Vienna. On February 14 he wrote to his father saying that he had finished two concertos and three quartets (in truth it was only two). This letter contains the famous phrase -“my mind gets easily dulled, as you know, when I’m supposed to write a lot for an instrument I can’t stand.” Critics have often taken this unguarded remark to an overbearing parent as a literal statement of truth, however it is more likely that Mozart was only making excuses for not completing the commission. This period of his life was less productive than usual due to his ill-fated romance with Aloysia Weber. Aloysia rejected Mozart later that year and married an actor and painter Joseph Lange. Mozart married her sister Constanze in 1782. The portrait of Mozart accompanying this note is by Joseph Lange and was painted in 1782. Mozart’s writing for the flute is particularly effective and sensitive. The instruments of his day were simpler than their modern equivalents and the notes could not be pitched so accurately. In his composition lessons Mozart taught his pupils a system of composition that took into account the inequality of the semitones, and how different colouristic effects could be achieved careful writing. With modern instruments and performance practice we almost certainly have lost some of the expressiveness that he intended. The concerto in C major is in the gallant style, and is bright and energetic throughout. It is in a conventional three-movement form with a fast and brilliant first movement in sonata form, a slow and lyrical second movement and a sprightly minuet in rondo form for the last movement. Mozart's Flute Concerto K313 was performed by the Portobello orchestra on the 8th July 2006. The soloist was Jane Easby and the conductor was Anthony Weeden.